Uefa president Michel Platini insists he will not return a £16,000 watch given to him by the Brazilian Football Confederation (CBF). Fifa has asked officials to return the watches handed out at the World Cup as football's governing body claims the gifts break its code of ethics. 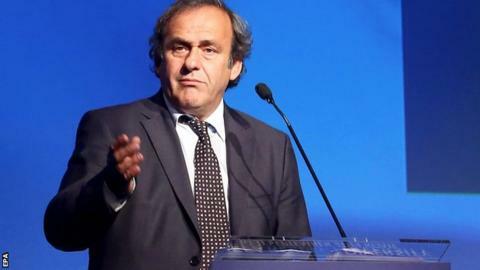 But Platini, 59, said: "I'm a well-educated person. I don't return gifts." Platini also said Fifa knew the items were being handed out in June and questioned why it only acted now. The watches were given by one of the CBF's sponsors to 32 association chiefs, 28 Fifa executive committee members and five other members of South American associations. "It is not hard to see why those who run football regard such gifts as nothing unusual. Fifa exists in a world where limousines fill the car park, and the average salary among its 412 employees is $220,000 (£122,500). Fifa can host as many ethics summits as it likes. But many will feel it still has a long way to go to regain the trust it has lost in recent years." "If the [Fifa] ethics committee was not pleased, they should've told us that four months ago in Brazil, when we received the watches," Platini said. "They were aware that we were receiving these watches because everybody received them. "Let me tell you, I was surprised. I was surprised, first of all, by knowing the value of the watch. I didn't realise it was that expensive. "We receive many watches, just like journalists - you receive many watches. Just like the associations receive watches. Yes, yes, you receive watches occasionally. Every now and again, you do receive watches. "But these are advertising watches and so forth. We all receive watches. I've received several. "But I was surprised on the one hand to see the value of the watch. "Secondly, I was very surprised by the press release of Fifa. I think that the best thing would have been to call us, to say that the ethics committee has done 'so and so' and they're not pleased. "Because there's an article in the British press, all of a sudden Fifa says that they need to return the watches. There's something that's very surprising to me in the way that this process has played out and I do not like that." Several officials did report the watches to the ethics committee and Football Association chairman Greg Dyke and Fifa vice-president Jim Boyce have since said they will return the gifts. Dyke, who had put the watch in a bag earmarked for charity, said he was unaware of the value of the gift and would have liked Fifa to have stepped in and taken action in Brazil. "I mean, how would I know it's worth £16,000? I have never had a £16,000 watch in my life. I've never paid more than £200 for a watch - to me, it is just a watch. "I think the whole culture of gift giving needs to be looked at again. Personally, I would get rid of it." Frenchman Platini added: "This watch is a gift. It's not actually the watch I'm wearing today. It's a gift I received. "The culture of gift-giving runs deep among football's power-brokers. I remember interviewing the former Fifa vice-president Mohamed Bin Hammam, now banned for life, in 2011 and his explanation that the Cartier timepiece on his wrist had been a gift from someone within the game. He refused to accept it could taint his judgment or influence how he acted toward that person or his organisation. Such largesse was thought to be a thing of the past. "Fifa revised its ethics code in 2011 to outlaw gifts that aren't of 'trivial' value. And yet still it persists, with the Brazil FA's goodie bags, placed in Sao Paulo hotel rooms before the World Cup, leaving administrators red-faced. Now the most fascinating question from this whole affair is how many of the 65 watches dished out will be returned, as requested, to Fifa." "I'm going to ask for the value of this watch and I'm going to give to a charitable organisation, a foundation, this value. But I can't return a gift. In my upbringing, I cannot return gifts like that." The CBF said it had paid $8,750 (£5,336) for each watch but Fifa's ethics committee obtained an independent valuation of 25,000 Swiss francs (£16,400). The ethics committee said in a statement: "The CBF should not have offered the watches, and those who received gift bags should have promptly checked whether the items inside were appropriate and, upon discovering the watch, either returned it or reported the matter. Fifa refused to clarify whether president Sepp Blatter received a watch and if so, if he had returned it. A statement said: "The deadline to return the watches by any person who received one is no later than 24 October 2014 as stipulated by the investigatory chamber. Please understand that we cannot communicate about individuals." The ethics committee said it would not instigate proceedings against officials who return the watches by 24 October. Meanwhile, Fifa has revealed it spent around £87,000 purchasing 750 watches which were given to delegates of the national associations who travelled to Sao Paulo for its annual congress in June. Fifa say the value of these watches - around £117 - is within the provisions of its code of ethics.